Switzerland stand in the way of Northern Ireland and a place at next summer’s World Cup after the nations were paired together in yesterday’s play-off draw. 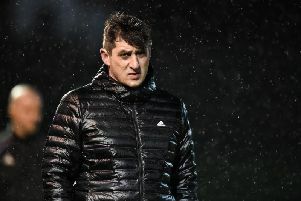 While Northern Ireland boss Michael O’Neill said he was pleased to avoid both Italy and Croatia, Vladimir Petkovic’s side are the highest-ranked team in the play-offs and sit 11th in the latest FIFA rankings. Here, we look at Northern Ireland’s forthcoming opposition in greater detail ahead of November’s matches. While Northern Ireland have only taken part in three World Cups, their play-off opponents are much more of a fixture at the finals. Switzerland first played at the World Cup in 1934, reaching the quarter-finals, and have participated in the last three tournaments, making it to the round of 16 in both 2006 and 2014. No previous UEFA-affiliated nation has failed to make it to the World Cup having picked up 27 points in the group stage. Switzerland had a near-perfect record in Group B but it was a record equalled by Euro 2016 winners Portugal - who beat Petkovic’s side in their final group game to secure top spot. Switzerland do not possess much experience in the play-offs, only appearing at this stage once in the past. They were victorious in 2006, beating Turkey on away goals after the tie ended 4-4 over both legs. Northern Ireland have never featured in a play-off for either the World Cup or European Championships and will become the 34th different UEFA member to do so next month. The Stoke forward is a key part of Switzerland’s attacking unit and has hit an impressive 20 goals in 66 appearances for his country. The diminutive former Bayern Munich and Inter Milan star could hurt Northern Ireland if given half a chance, while Benfica striker Haris Seferovic can also cause plenty of problems. Arsenal midfielder Granit Xhaka and Shaqiri were the two Premier League players called up for the games against Hungary and Portugal. The pair played every minute of both games, with Xhaka opening the scoring in the 5-2 win over Hungary. Huddersfield defender Florent Hadergjonaj, West Ham’s Edimilson Fernandes and Timm Klose of Norwich have also recently featured for the senior side.